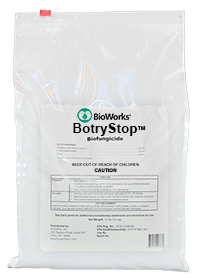 BotryStop® Organic Fungicide is an effective biological fungicide developed specifically for the control of pathogens such as Botrytiscinerea,Sclerotinia sclerotiorum and Monilinia spp. It is based on the naturally occurring non-pathogenic saprophytic fungusUlocladium oudemansii Strain U3 and provides protection to blossoms, fruit and plant tissue. BotryStop utilizes Ulocladium oudemansii Strain U3, a novel new biological weapon and approach to organically fight tough diseases. When BotryStop spores are deposited on the dead and senescent plant debris they germinate and colonize. The developing mycelia proceed to colonize dead tissue and additional sporulation can occur. These new spores are then available to colonize remaining plant debris. BotryStop aggressively occupies the same physical space and out-competes pathogens for the nutrients in dead and senescing plant tissue. • Excellent tool for resistance management. • Tank-mix compatible with some chemical inputs. • Control as good as a full-season chemical program can be achieved with a BotryStop program. • OMRI Listed for organic production. • Exempt from residue tolerance. • Use at or before the first sign of disease. • 4-hour REI, 0-day PH. wide array of tough to cure diseases and is safe for pets, animals and children. BotryStop Fungicide can be applied to a wide variety of field, greenhouse and high-tunnel grown trees, vegetables*, grapes and other small fruits. It can also be applied to ornamentals in greenhouses and nurseries. It is NOT labeled for use on vegetables and for certain diseases in California. Please see label for details and check with your local laws to ensure this product can be used in your area. *Not labeled for use in California. General Application: Apply BotryStop at a range of 2-4 lbs. per acre. The most common rate is 3 lbs./acre. Powdery Mildew: To cure powdery mildew, apply up to the maximum rate (5 lbs./acre) every week for three weeks.
. Shorten the interval during rainy weather or during periods of high relative humidity.
. Use sufficient water volume to provide complete coverage and wetting of plants.
. A non-ionic surfactant or spreader sticker must be used when making applications.
. Use of organosilicone surfactants is beneficial when spraying low water volumes (below 50 gallons per acre). Do not use organosilicone surfactants that claim to be “penetrants” or “stomatal flooders or infiltrators”.
. Ensure constant agitation throughout the loading, mixing and application operations.
. Multiple applications may be needed depending on crop and disease pressure. For BotryStop Compatibility Cart Click Here. Ulocladium oudemansii (U3 Strain) ................................................... 45%*. *Contains not less than 8 x 107 cfu/gram. 12 lb. Bag (Covers 4 Acres on Average).